Representation of the Russian Orthodox Church to the European Institutions. On 14 April 2011, President Mevlüt Çavuşoğlu of the Parliamentary Assembly of the Council of Europe met with hegumen Philaret (Bulekov), deputy chairman of the Moscow Patriarchate’s Department for External Church Relations, who completes his duties as representative of the Moscow Patriarchate to the Council of Europe. A presentation of Patriarch Kirill of Moscow and All Russia’s book entitled Freedom and Responsibility. In a Search for Harmony. Human Rights and Personal Dignity took place on April 11, 2011, at the London International Book Fair. On 20 January 2011, the European Parliament took an unprecedented step by adopting a resolution on the situation of Christians in the context of freedom of religion. It is for the first time that a major political body of the European Union recognized that Christians are persecuted. Brussels, July 20 Interfax - European Union leaders state they are ready to a closer dialogue with religious organizations, especially in settling social problems. Speaking at the meeting of the EU leaders with religious leaders held in Brussels, President of the European Parliament Jerzy Buzek said that they appointed vice-president of the European Parliament responsible for interaction with religious organizations. The task of the meeting was to discuss the participation of Orthodox Churches in dialogue with the EU institutions in view of the implementation of Article 17(3) of the Treaty on the Functioning of the European Union (TFEU), which reads: Recognizing their identity and their specific contribution, the Union shall maintain an open, transparent and regular dialogue with these churches…”. Acting representative of the Moscow Patriarchate at the European Union Archpriest Antony Ilyin "extremely positively" regards election of Belgian Prime Minister Herman van Rompuy as the first President of the European Council. 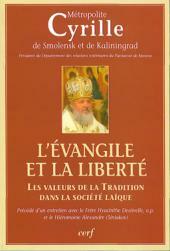 Metropolitan Kirill of Smolensk and Kaliningrad, chairman of the Moscow Patriarchate Department for External Church Relations, presented, on June 15, 2006, in Brussels, the French version of his book entitled ‘The Gospel and Freedom. Traditional Values in Secular Society’. Published by the Serf Publishers, the book includes the metropolitan’s interviews and fifteen articles devoted to such major problems of today as dialogue of liberal and traditional values, human rights and moral responsibility, church and society, and social service of the Church. This is the first book to be published by a modern bishop of the Russian Orthodox Church in French. On 30 May 2005 the leadership of the European Commission met with 15 European religious leaders representing Christianity, Judaism, Islam and Buddhism. The European Commission was represented at this meeting by its President José Manuel Barroso, the Chancellor of the Austrian Republic Wolfgang Schüssel, the Commission’s Vice-Presidents Margot Wallström and Franco Frattini, the Commission members Jan Figel and Vladimir Spidla, as well as the political advisor to the Commission’s President Michael Weninger. The consecration of the Holy Trinity patriarchal representation church in Brussels and adjacent premises of the Russian Orthodox Church’s Representation to the European international organizations took place on March 30, 2003. On 19 January 2003, the feast of the Epiphany, Her Majesty Queen Paola of the Belgians visited the Representation of the Russian Orthodox Church to the European Institutions in Brussels and attended the ceremony of the great blessing of the waters at the newly opened Church of the Holy Trinity. ©2002-2014 Representation of the Russian Orthodox Church to the European Institutions.